From a news perspective, this ambiguous picture was great because it forced me to read the rest of the article. But from a building and architecture perspective, it illustrates one of the primary problems with big box retailers: they’re so utterly generic that even a photo reveals nothing about their setting. Though the incident happened in West Valley City (no surprise there), this picture could easily depict the Kmart in Provo’s East Bay. 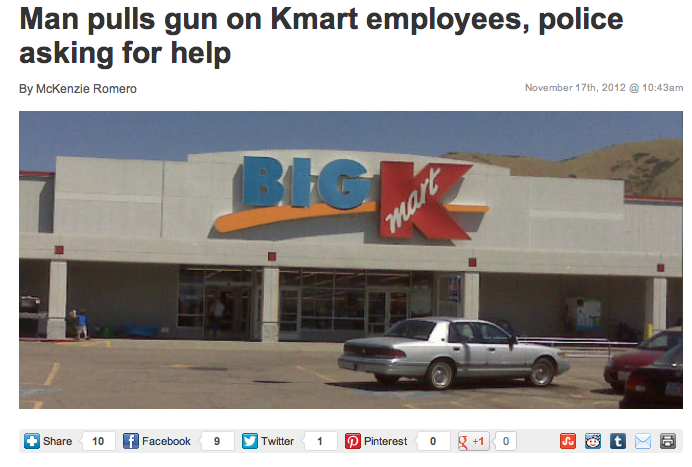 In reality, it could probably depict most of the Kmarts in America. I don’t even know if this picture actually shows the Kmart where the crime happened; it could just be a stock photo owned by the news agency. Ultimately, the most telling thing in this photo is the hill behind the store and even that is mostly obscured by the ugly building. The point here is that the best places are unique. They create a one-of-a-kind sense of identity and people appreciate them for that. Downtown Provo is one such place. Many of the destinations people spend money traveling to similarly create settings that emphasize their uniqueness. But locations like the one in the picture above aren’t just ugly, they also deny communities their inherent sense of individuality. And that’s a problem. 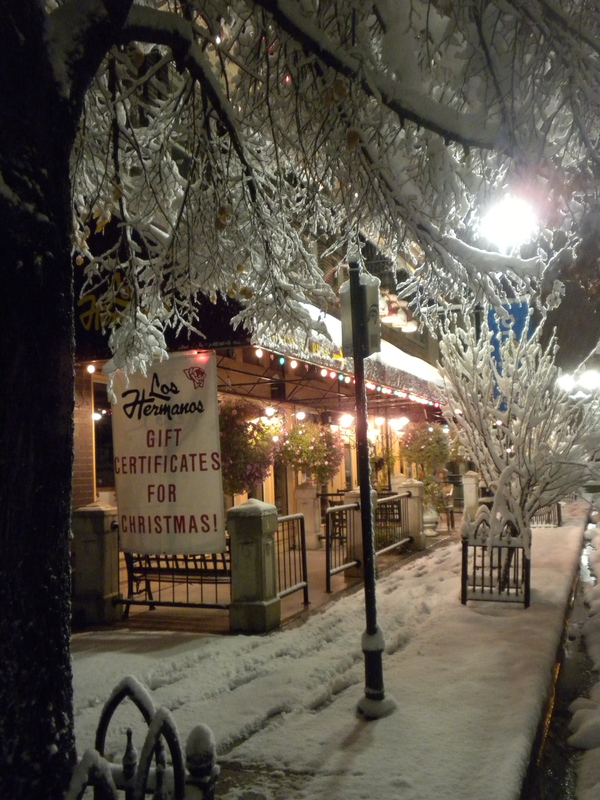 One of the most remarkable things about downtown Provo, perhaps the most remarkable, is how independent it has stayed. There are more restaurants per square mile than all but the most touristy of places, for example, but no chains. The result is innovation, creativity and an unparalleled experience. Everyone has their favorite places in downtown and it’s a testament to the diversity of the area that there are so many differing opinions; it takes a lot of hard work and success to inspire wildly different but devoted fans. 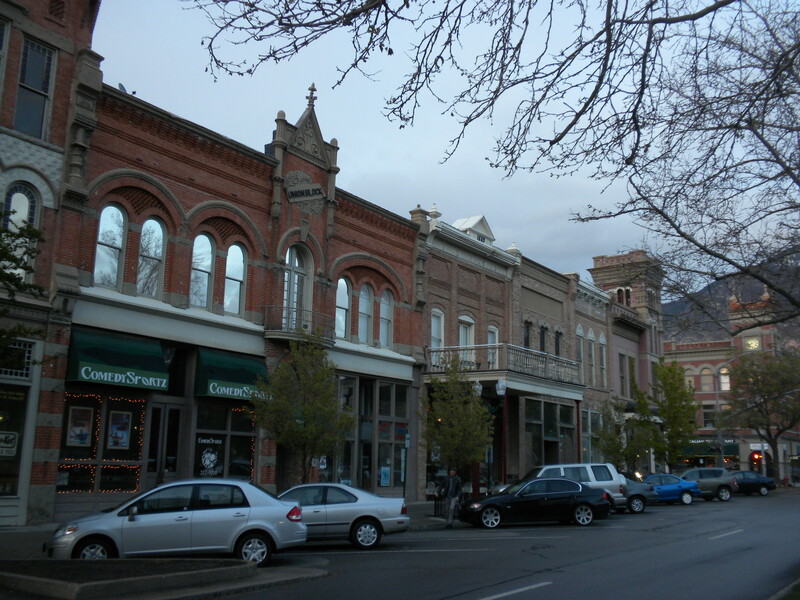 Downtown Provo is filled with innovative and independent businesses. A new Facebook page has been created to help foster that environment. Recently, a friend asked if I’d be interested in jumping on as an administrator for the Keep Downtown Independent Facebook page. And after a quick conversation, I realized it was something I definitely support. As I see it, the idea is to keep downtown Provo filled with creativity and innovation. It’s to keep local money in the local economy. It’s to continue building downtown and making a great place, or a greater place. Every city should have a page like this, and many probably do. But if you care about building a great city that isn’t generic or like anywhere else in the world, go like the page. 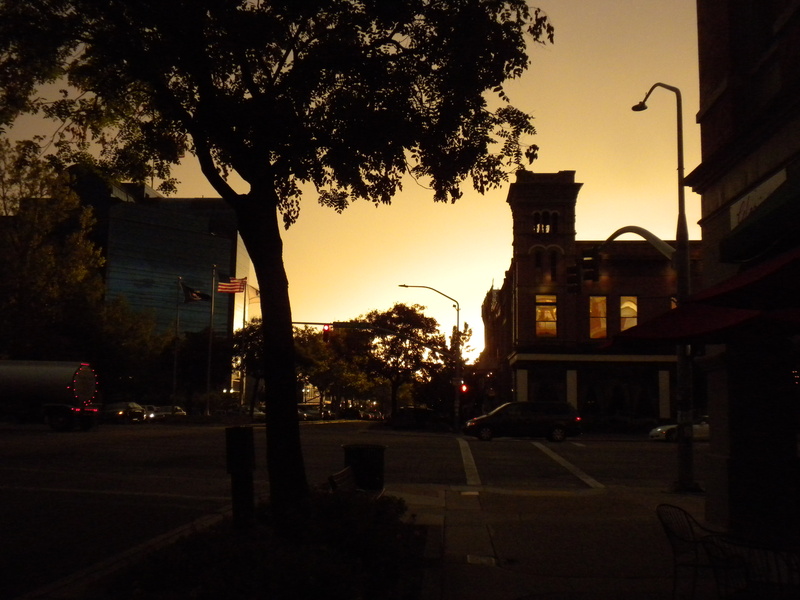 And while you’re at it, share your vision for the future of downtown Provo. 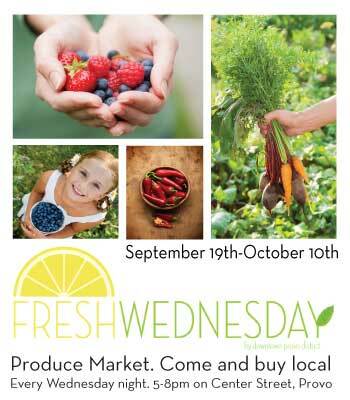 Tonight marks the first ever Fresh Wednesday Produce Market. Basically, it’s a farmers market focusing exclusively on locally grown produce and nothing more. It’ll happen on center street. The market is being organized by Downtown Provo Inc. and will have roughly six local vendors. The idea is to grow it with time. I was also told that it’s being done in partnership with the Provo Farmer’s Market, which happens every Saturday. Downtown Provo’s restaurants are diverse, surprising and as I argued in May, creating a kind of culinary renaissance in the city. But while the number of restaurants is remarkable, what really gives Provo an edge over other places — some of which are larger or more conventionally cosmopolitan — is innovation. In other words, it’s the combination of breath and creativity that is igniting a food scene right before our eyes. I’m not much of a pork guy — or a big meat-eater generally — so I was initially a tiny bit skeptical. What I ended up experiencing, however, not only laid my fears to rest but even exceeded my preconceptions about what dining in downtown Provo could be. The meal took place at a communal table. It was the kind of seating arrangement that’s often awkward for a minute or two, but then ends up fostering unexpected connections. In my case, I ended up talking more to the new friends who sat around me than the companions I showed up with. 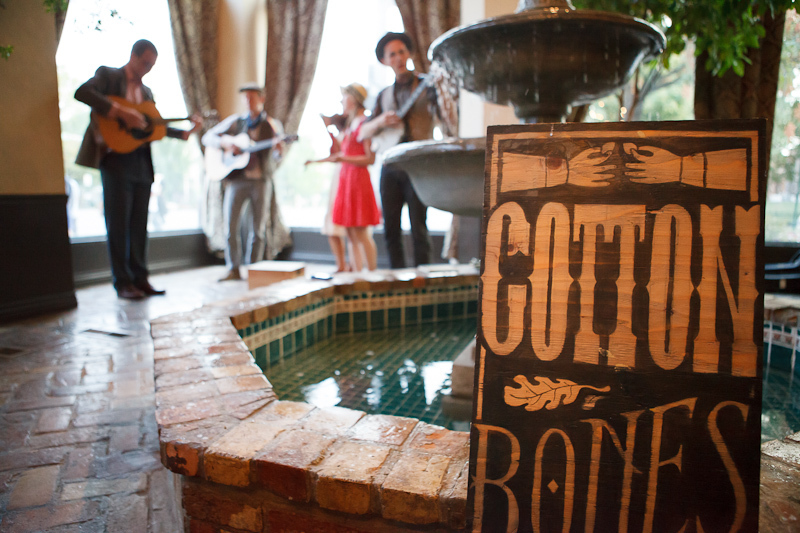 The ambiance was further enriched by Appalachian-style folk band Cotton Bones. 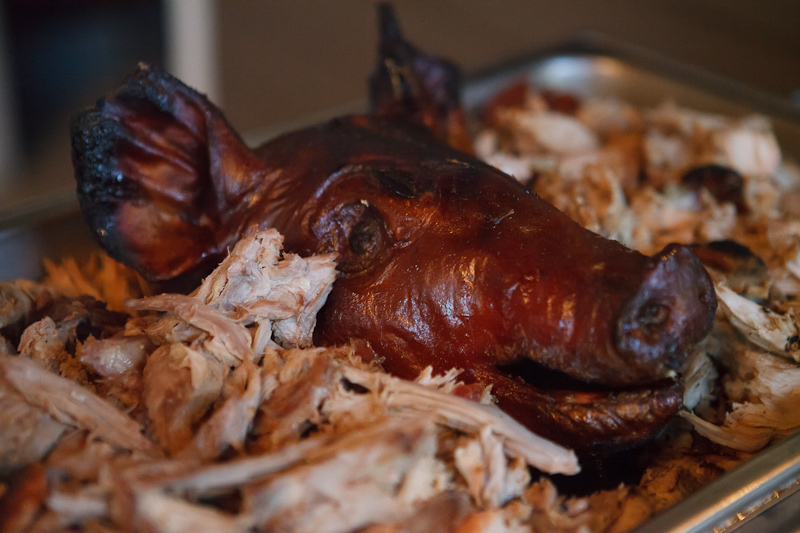 As advertised, the menu included roasted hog, hushpuppies and more. Frankly, I’ve had trouble figuring out how to describe the food because despite its obvious roots in traditional American cuisine I’ve never really had anything quite like it. It was delicious, and the combination of salads, the meat, the hushpuppies and other fare amounted to far more than the sum of the individual parts. The ultimate effect was rich without being over-heavy. 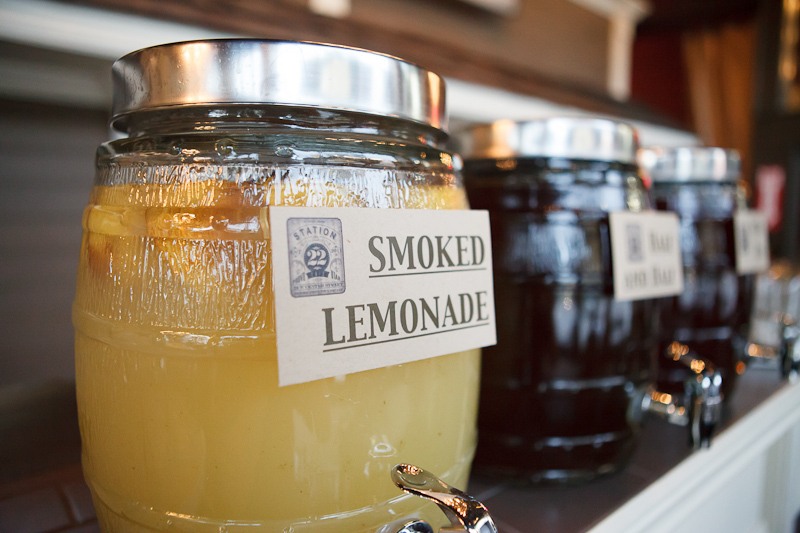 The smoked lemonade was also particularly distinctive and unlike anything I’ve previously tasted. But most importantly, the entire experience was obviously an exercise in innovation. Like successful art, the food was a creative interpretation of existing concepts. The setting and set up were orchestrated for hyper engagement. The environment — especially the music — was meant to interact with the food. Most restaurants — including all chains I’ve ever experienced — never even approach this idea. Hopefully, they serve satisfactory food but either way they’re not thinking of eating as enlightening or humanizing. Station 22 clearly is, and that’s why Provo’s culinary scene is heating up; food is being recognized as a way to explore more than just our bellies. Station 22 isn’t alone, of course. Communal, for example, holds both instructional and meet-your-farmer dinners that aim to enrich community members’ interaction with food. Black Sheep Cafe uses food as an expression and exploration of Native American culture. Last year, the Heirloom people hosted a giant fundraising dinner on a farm which turned out to be one of the best eating experiences I can remember. Those are all examples of restaurateurs exploding traditional paradigms. Ultimately, not every restaurant in downtown is trying to reinvent the eating experience. Many of them just serve really great food, and that’s important too. But taken together, these various culinary philosophies are building a renaissance and they’re building a scene. * Jason Ross Williams was kind enough to let me use his photos of the event at Station 22. He also photographed the first Supper Club and has many other cool images on his website. We Can Have Better Neighborhoods if We Just Choose to Build Them: People sometimes talk about cities as if they’re immutable. But that’s a fiction. People built our cities and I believe there is no obstacle — from zoning to public opinion to financing — that people also can’t overcome. If our cities are imperfect it’s because we yet lack the will to fix them. Trading Historic Buildings For Blight and Parking Lots: This post explains how a local developer wanted to turn an old church into apartments, but then despite everyone’s enthusiasm, the project was stalled or killed by absurd city fees. What to do With Wasted Street and Parking Space: Like many cities, Provo includes a fair amount of underused pavement. Parking lots sit empty, streets are too wide, and there’s less room for people. This post suggests that all the wasted space could simply be cordoned off and turned into pedestrian zones. Blame Streets for Auto-Bike Accidents: Poor road design not only doesn’t help prevent accidents, it actively encourages them. What City Creek Could Have Been: City Creek in Salt Lake City is great. But this post tries to imagine what could have been if investors had used the $2 billion they spent on the mall to fund startups and business development. Hint: the results would have been much better. This post is part of an ongoing effort to think about the implications of local and non-local commerce. Squares and the Heart of a City: Provo has no public squares. Let’s fix that. Provo, Utah: A great city that will get even greater if we’re smart, informed and work really hard.